Vegan desserts are a sweet and delicious way to end a meal or enjoy a treat. Just about any of your favorite desserts can be made completely dairy-free. Browse through this inspiring collection of vegan sweets to find the perfect finish to your meal. By using a vegan pie crust, you can make pumpkin pie and most fruit-based pies vegan for a classic all-American dessert. This pumpkin pie uses soy milk and cornstarch to form the custard. As a bonus, you can make it gluten-free as well. Vegan pies can be incredibly easy to whip up in a blender using silken tofu as a base. If you haven't tried this technique, use it for this Key lime pie with a vegan graham cracker crust. Even better, there is no baking, for a very easy pie. A brown sugar and cinnamon crumble on top of this apple pie makes for a delightful traditional dessert. You can use a store-bought pie crust, or even a simple homemade vegan graham cracker crust. This pie saves you the most time-consuming part—making the crust. Use vegan phyllo pastry for a flaky, foolproof crust that shows off the delicious blueberry filling. Once you know this trick you can use it with other pies. 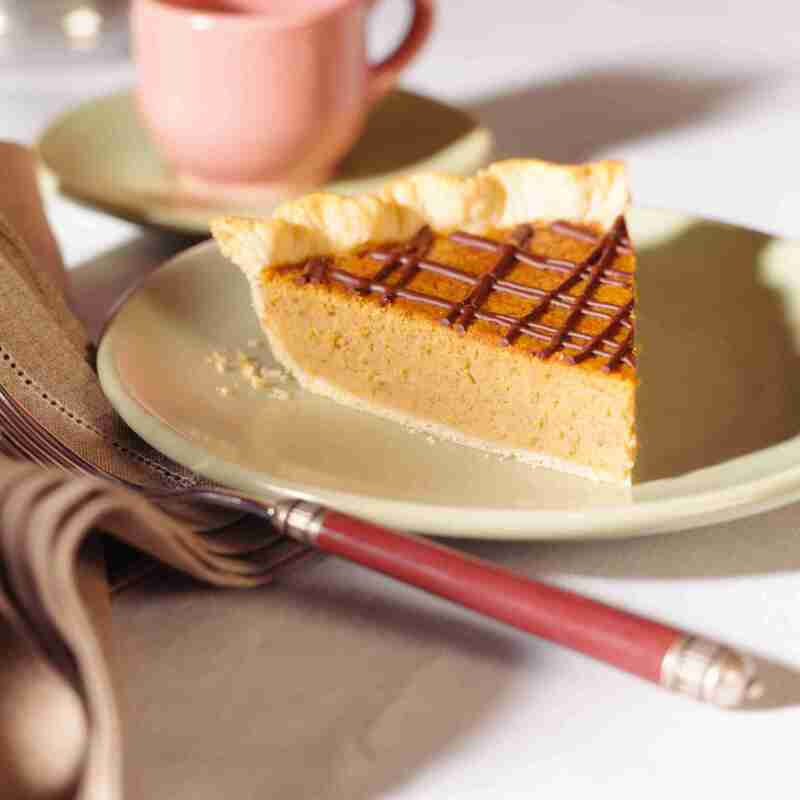 This is the quickest and simplest way to make sweet potato pie. Use your blender to combine the ingredients, pour it into a prepared pie crust, and bake it. Banana cake will be welcome at any gathering and it's easy to make. Simply slice it to serve with coffee. Or, you can frost it with a vegan cream cheese frosting and top it with crushed nuts. Vegan cakes are usually lower in fat since they're egg-free and dairy-free. Mix the simple ingredients, pour it into a cake pan, and bake. What could be easier? The generous amount of cocoa in this cake makes it absolutely heavenly. Many packaged cake mixes, such as most from Duncan Hines, are vegan. By using soda you can skip adding the egg and milk. Use this simple recipe to transform your favorite cake mix into a vegan cake. It will be in the oven with only two minutes of preparation. Then add your favorite vegan frosting and you can serve a traditional-looking vegan sheet cake or layer cake. Vegan cheesecake will come surprisingly close to a real cheesecake, and all you have to do is to mix the ingredients in the blender, pour into a graham cracker crust, and bake. Drizzle the top with a bit of chocolate or fruit sauce for extra flavor, and you'll impress your friends for certain. Use vegan cream cheese to make this easy Key lime cheesecake. It takes a few ingredients and you will have a delightful pie with no fuss. Most cookie recipes take a little more time because you mix the dry ingredients and then mix the wet ingredients. Make it easy by using a cake mix (most are vegan, check the box). Then you A banana substitute vegan egg replacer and oil to make cookies. Add vegan chocolate chips, raisins, or whatever pleases you. Or, take the slightly less simple route for classic vegan chocolate chip cookies. These healthy cookies use applesauce instead of margarine or oil. You can feel good serving them to your family and they are simple to make. You need only four ingredients, plus water, to make this vegan chocolate sorbet. There are instructions for making it with or without an ice cream maker. Use four ingredients to make this vegan strawberry sorbet in your blender or food processor. You don't even need an ice cream maker. Kids and adults will enjoy this classic. Vegan fudge is easier and more foolproof to make than non-vegan fudge. Use just five simple ingredients for this sweet treat. Two great tastes that go great together—peanut butter and chocolate. You need only five ingredients to make this tempting fudge. They may not be the most trendy of the various vegan desserts on offer these days, but an old-fashioned homemade Thanksgiving pumpkin pudding is a comfort food dessert. Or, enjoy vegan vanilla pudding. Make a raw vegan treat easily just using your blender and freezing these popsicles. It's a delightful way to cool down in summer.